Matching Dragoons: Weird Western Tales #26 "Face-off with the Gallagher Boys!" Weird Western Tales #26 "Face-off with the Gallagher Boys!" "Face-off with the Gallagher Boys! " The story starts off with the 5 member gang of the Gallagher Boys pulling apart the rails in front of an oncoming train. Naturally the train derails horribly and the Boys head for the payroll car. Jonah has been trailing them for 2 months and gets the drop on them during the robbery. He kills one and then is forced to jump into the overturned payroll car to avoid being shot by one of the gang. They slam the door and lock him before they ride off. A few minutes a posse rides up (where they came from is anybody's guess) and assume that Jonah is part of the gang that got left behind. They cuff Hex and take him to town to stand trial. Meanwhile, we get an interlude as the Gallaghers make their getaway. They are aided by local ranchers that hate the railroads. The ranchers misdirect the following posse and the Gallaghers end up at the home of Mack & Martha and their teenage daughter Debbie. It's very obvious that Debbie & Ben, the leader, have a flirting relationship. Back in Poozle Junction (honest to God, that's the name of the town) Jonah is jailed and kicked into his cell. Later he is offered coffee and when he refuses, it's thrown in his face by the deputy. Back in Virginia, it is raining in a graveyard as a surrey pulls up to a grave marker. The man with the Eagle-topped cane disembarks and lays flowers at the grave of his son. He rants for a few panels to his servant, Solomon, and then gives him a letter to mail. A few days later the letter finds it's way to the Gallagher's hideout. How the man in Virginia knows the Gallaghers or where to find them is never addressed (haw haw, addressed, git it?) 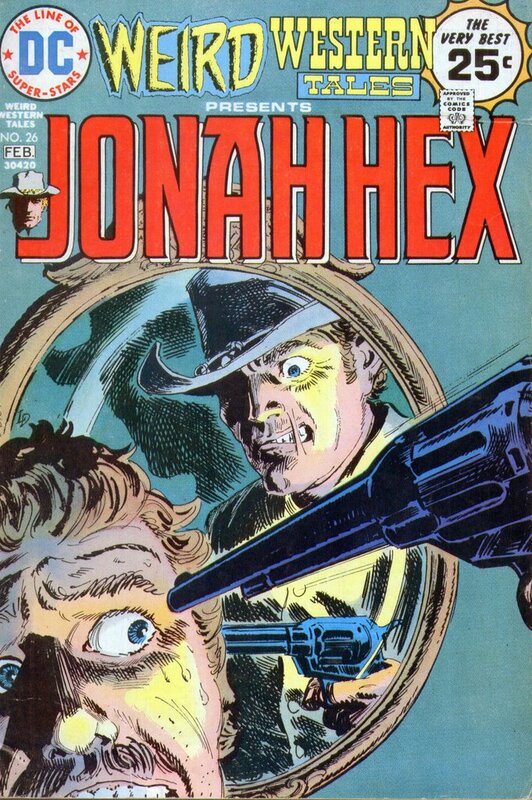 but he has offered them $10,000 for killing Jonah Hex. Ben Gallagher convinces Debbie that Jonah is one of their gang and enlists her help to free Hex. That night Debbie goes into town to take some soup to the deputy (who does recognize her). As he is scarfing down the soup, she slips the key ring to Jonah. 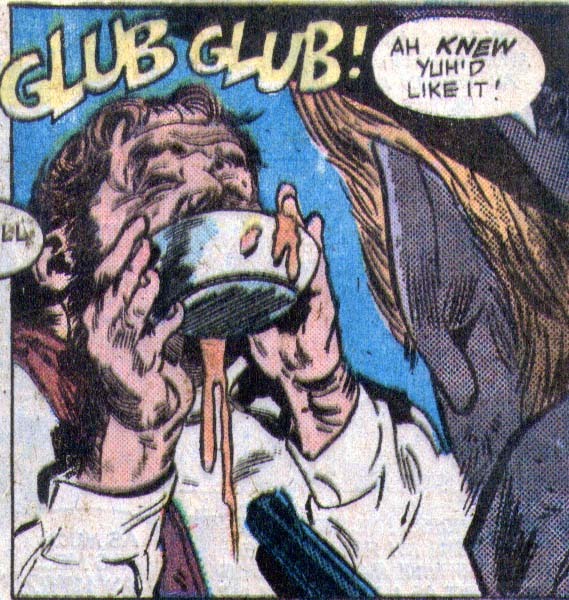 Not to look a gift horse in the mouth, Jonah gets out of the cell, pulls a gun on the deputy, empties the contents of the ashtray into the soup and then forces the deputy to eat it. When the deputy stands up, choking on the nauseating mixture, Jonah cranks him in the head with the ashtray, knocking him out. Jonah follows Debbie back to the ranch and as they enter the house Debbie comments how about Jonah's 'friends'. Before Jonah can respond, the door swings open and the Gallaghers usher Jonah inside at gunpoint. They sit Jonah in a chair & and mention they are getting paid by a ma in Virginia to kill him. Debbie intervenes since she's angry at being fooled & used. She shoves Ben, shouting that he's just a murderer. 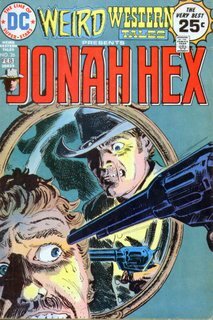 Mack quickly responds by grabbing a shotgun from the mantle and tosses it to Hex. Almost everyone hits the floor as Jonah opens fire with both barrels, killing two of the gang and wounding a third. 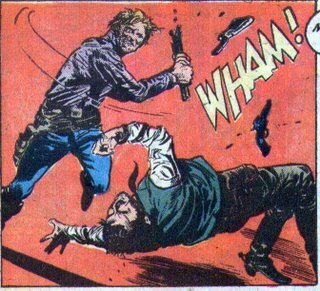 Ben starts to draw down on Jonah but Jonah literally busts the shotgun over Ben's head. The next morning, Jonah leaves to take the gang to town & clear the slate with the sheriff. As he leaves he makes a mention that maybe someday the railroads will all go bankrupt and that maybe he needs to go visit Virginia. Men killed by Jonah - Four. 3 of them were shot and Jonah busted a shotgun across Ben Gallagher's head so hard that he appears unconscious the next morning (?). I'm assuming that he's dead. Timeline - Since this does contain a reference to the Man with the eagle topped cane it takes place prior to Jonah heading back to Virginia. This part of the timeline starts getting real sticky & I'm sure that we'll have to come back & revisit it. There is nothing else in the story to place it in the timeline. I would rate this near the very bottom of Hex stories. The Doug Wildey art is very murky with the ziptone shading, that just doesn't work on newspaper especially when it is colored on top of it all. The story consists of Jonah shooting a guy, getting jailed, being freed, and shooting 3 more guys. If they had phones back then, he could have phoned it in. Also, Fleisher has a bad habit of making rewards in the thousands of dollars as opposed to hundreds that they probably were. Every dollar in 1875 is equal to sixteen in today's dollars. That means that $10,000 offer is $160,000 today. That, coupled with the bizarre unexplained way as to how the man with the cane knows how to find the Gallagher boys, just really seals the lid on a bad story that is already dead. Next issue - Jonah rocks the vote & is revealed as a cross-dresser. glad that they decided to bring him back.